Product prices and availability are accurate as of 2019-04-24 13:08:02 EDT and are subject to change. Any price and availability information displayed on http://www.amazon.com/ at the time of purchase will apply to the purchase of this product. 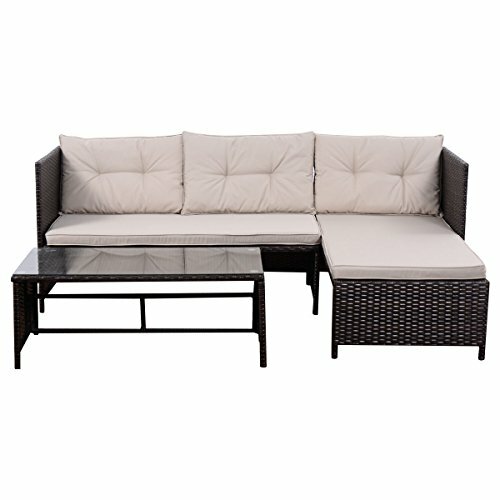 【Material & Durable】Tangkula 3 Piece rattan sofa and chaise lounge set is made of high quality steel frame and PE wicker. The material is rust-resistant and heavy duty. 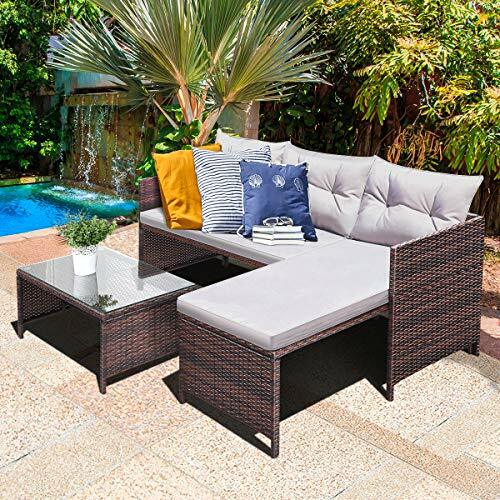 PE wicker will last longer than normal wicker and all weather proof. 5mm thick tempered glass is solid and safe. Seat cushions are made of 25D sponge, polyester fabrics, back cushions are made of PP cotton and polyester fabrics. The set is perfect for outdoor use and last for years. 【Variety & Practical】The mix brown wicker furniture will be suitable for any décor. 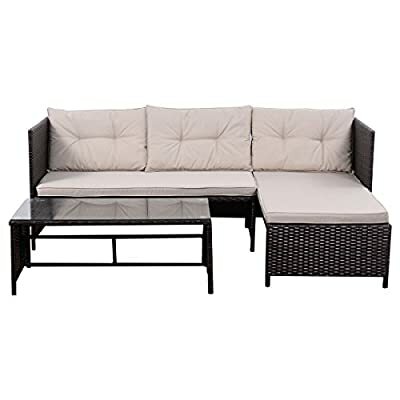 The set can be used as chat set or lounge sofa by poolside. 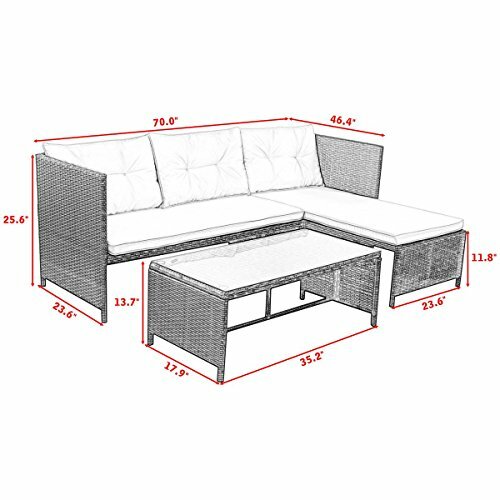 It can be arranged in variety ways to accommodate your outdoor or indoor space. The seat cushion is easy to clean and replace since zipper cover. 【Installation & Measurements】The wicker set is not hard to put together, if you can follow our clear manual. 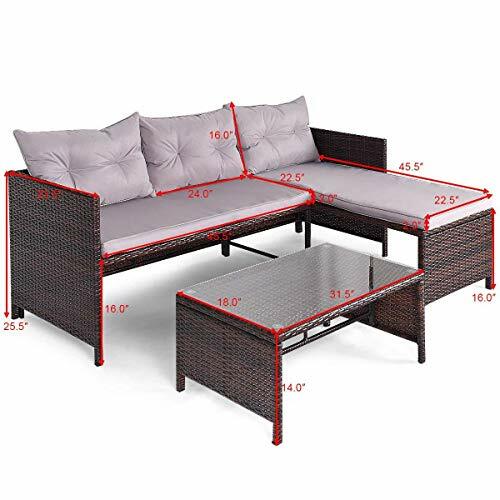 Size of lounge sofa: 46.4"X23.6"X25.6"(LXWXH), Size of loveseat: 46.4"X23.6"X25.6"(LXWXH) Size of coffee table: 35.2"X17.9"X13.7"(LXWXH), Size of seat cushion: 45.6"X22.0"X2.0"(LXWXThickness), Size of back cushion: 23.6"X15.3"(LXW) 【Package & Shipping】There is only 1 box. All necessary parts are also included. 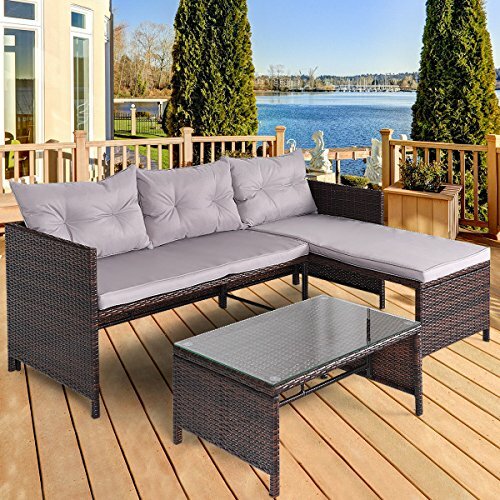 The warehouse of wicker outdoor furniture is in America. UPS will take the package to your home door in 3-6 Business days. 【Customer service & Guarantee】With our clear manual, it's easy to assemble. If there is any questions plz feel free to contact with us, our experienced customer service team will response in 24 hours. We packed the set as good as we can, if there is any part missing or damaged during shipping, please contact us first and offer us pictures of damaged part, we will solve the problem as the way you want(replacement at no charge or discount).